Fahrenheit is fun, especially for its lack of pretension. The view from Fahrenheit’s outdoor seating on 52nd and Bogyoke Road is definitely more chaotic than the placid lake sunsets over Inya lake, but there’s something incredibly refreshing about the casual no-nonsense vibe that’s due in part to the fact that the most dedicated waiters are the owners themselves. The brainchild of Fab Party organizers Jeewee and two friends, Fahrenheit is dripping with personality. It has steered clear of the posh, reclaimed, colonial interiors and leather couches that are increasingly popular in downtown venues. 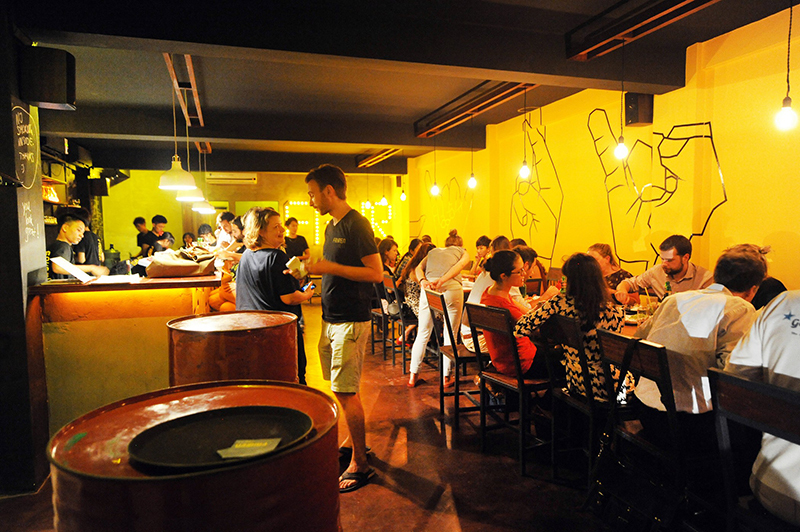 Instead, art inspired by sign language lines the walls that have not been turned into blackboards, lending the place a cool, upscale feel that’s combined with a menu where nothing costs over US$8. One thing that’s remarkable about the Yangon restaurant scene is how patient and understanding patrons are willing to be as venues get off their feet. Many new players in the restaurant market are individuals with big dreams and strong friendships but little restaurant experience, and yet none of the customers around me seemed to hold that against the Fahrenheit crew despite problems with food availability and slow service. No guacamole? No problem, the nearest table exclaimed, noting that at the time the restaurant was still in its “beta” phase. No burrito wraps for chimichangas? 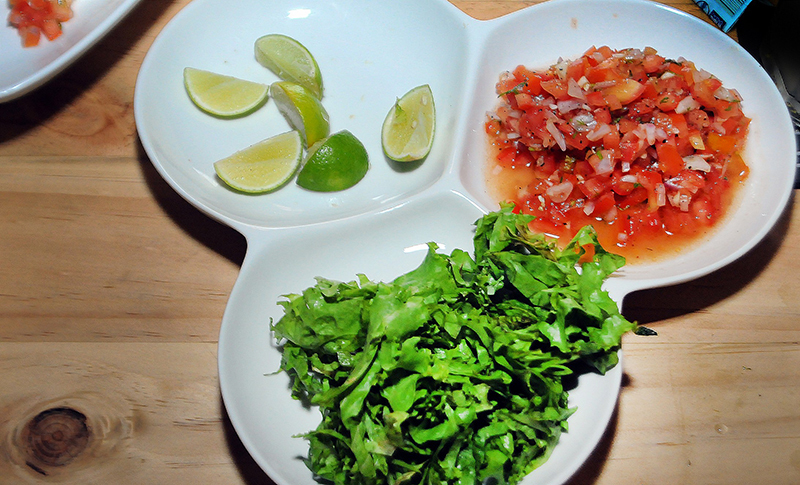 In my case, that meant doubling down on the tacos, and I readied myself for the series of cheesy, fried, spicy, Mexican-inspired dishes that were about to come my way. The kitchen at Fahrenheit is headed by a woman whose culinary background is actually in French fine dining. She has embraced the challenge of making tortillas in-house and sourcing ingredients locally whenever possible. She was still smiling on a Thursday night after a hectic week in which Fahrenheit all of a sudden became the most popular restaurant in Yangon. 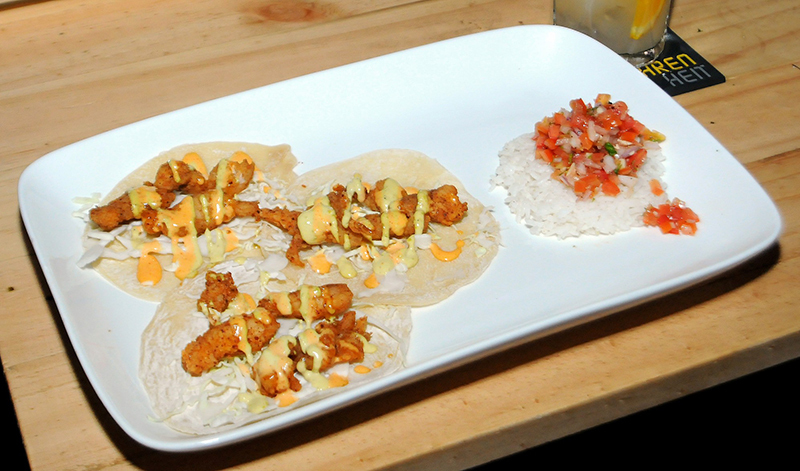 Her fish tacos are definitely something to smile about. Lightly fried, served with a generous dose of Fahrenheit’s “yellow secret sauce,” they make for incredibly hearty bar food. It was clear from that first bite that the kind of cuisine this chef is aiming for is far from the gourmet delicacies of her former workplaces. Just as the venue is practical, the food is aiming for a rich quality rather than for subtlety and complexity. 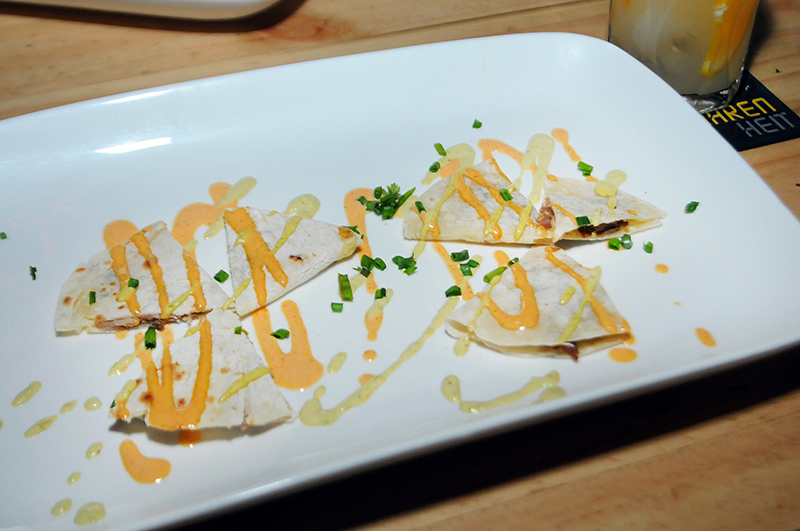 Take the sweet pork quesadillas. They are absolutely satisfying in a guilt-inducing, plastic-wrapped-cheese-slices kind of way. This does not sound the slightest bit appealing until you take one bite of the wonderfully balanced creamy, chewy, salty, tortilla-encased pork morsels. Once you do, it’s hard to stop. That said, the cuisine is still a bit of a hit or miss; while the pork tacos were great, their chicken counterparts were lacking in flavor and didn’t come with rice, like the pork did, raising concerns about the reliability of the food. Will it be good sometimes and less so other times? This may be worked out in the coming weeks, as the restaurant has just ended its trial opening period and is now fully operational. As it stands, the place excels in personality and atmosphere even if the food isn’t yet stellar. The owners clearly have a strong vision of what they’d like Fahrenheit to be, and the décor and friendliness of the staff is already making it a place to return to—not just once or twice, but often. The venue is so welcoming, in fact, that Jeewee may have been onto something when he suggested that I let others enjoy their romantic sunsets by the lake while I sip on a cold beer, nibble on some fish tacos, and watch the day turn slowly into night among the chaotic, noisy rumblings of downtown. Fahrenheit is located at 38 Bogyoke Road in Yangon, open daily from 5pm to 11pm. This article originally appeared in the June 2015 issue of The Irrawaddy magazine.